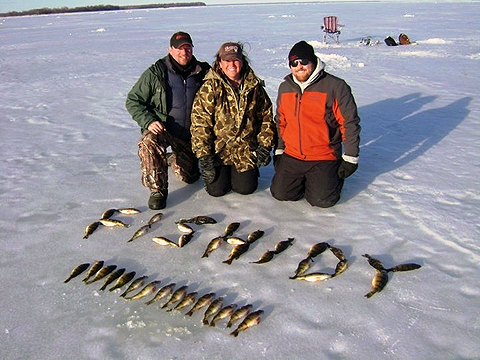 Join us for a real-time, online chat with Fishidy's ice fishing community to discuss tips for targeting different species, equipment, and how to be efficient with your time on the ice. All fishing skill levels welcomed! Why do smallmouth bass and musky get so dormant in the winter in our nearly impossible to catch through the ice?
. Electronics help a ton! During the middle of the day can be pretty tough for me sometimes. Usually I'll fish deeper, and have had some success, but the best bite always seems to be dawn and dusk. Great point about reading through the ice, Rich! I will also add that for locating prime structures a good GPS with a depth contour overlay is very valuable. Any specific tips for northern pike? Does anyone have any feedback on using a forage minnow tipped with a minnow head for late season walleye? Bigger pike like access to deep water, especially in early winter. I like to set tip ups on weed edges at the top of sharp dropoffs. Tony, that is one of my most favorite techniques for late ice! For some reason the silver seems to be my best color. Don't be afraid to go big either. The closer to spring it gets, the more their metabolisms speed up in preparation for the spawn. Another great technique for late ice walleyes is blade baits. One of my new favorite techniques is rigging the Echotail Blade Bait by Vibrations Tackle with a live crappie or fathead minnow on the back. Vibrations Tackle, LLC's Echotail creates a fishing tackle line of fishing lures that are like blade baits to help catch any kind of fish in any environment. Alright final topic before moving onto Q&A, Maximizing Your Time, and a question for our panel. Between jigging, tip ups, live bait, artificial bait, etc. how do you keep yourself organized? For maximizing my time, I like to jig with artificial lures until I know I've located fish. Fishing lures makes it very easy to stay mobile. Once I'm on fish, I'll usually set some tip ups. For jigging applications, live bait is usually a last resort for me. Also look for holes from previous fisherman that showed signs of activity like weeds, bait or even blood and fish those holes can save a lot of time. 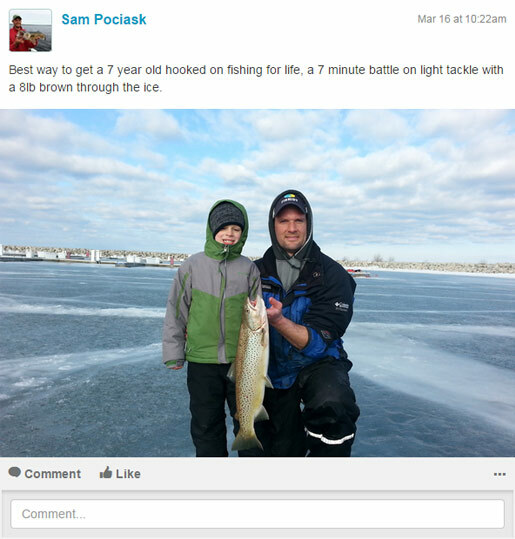 Speaking of Fishidy and the mobile app, how do you guys find its most effective as it applies to ice fishing? I use fishidy extensively to find high percentage areas on bodies of water that I've never fished before. It's also a cool way to follow seasonal movements if you keep track of your catches! use the GPS along with the fishidy map to position yourself on productive areas. I like to do research or "prefishing" on the website! It is a game changer in the ice fishing market! Especially with the increasing service area and speed of phones for the app!!! Good point Noah, logging of catches is huge! I agree with Noah. Fishidy can be thought of as a fishing journal. You can look at the map of your favorite waterway, and check out your own previous catches as well as those from other people, along with all of the corresponding catch data. Alright well great, let's open up the floor for some general questions! One of the quickest ways to become a better angler is to understand the fish you are targeting. By learning their seasonal movements and patterns, you can cut out a lot of water and narrow your search to high percentage areas to maximize your time on the water (hard or soft)! Have any of you ever used a propane powered auger? What are your thoughts compared to gas powered? Like I mentioned before, a great place to start is what you might consider to be your classic walleye structure. It depends a lot on the body of water you are fishing. Generally You want to find areas that have fairly quick depth changes. Walleyes will usually chase baitfish up against these drops or sit on the edge of them. I have only used an electric auger and I love it, no gas to mess with or fumes if in a shed to deal with. When jigging for fish are you guys doing slow up and down jigging or ripping it up and letting it sink? Any tips for taking kids fishing for the first time? Ok everyone that's it for tonight's chat session! Thanks for attending and big thank you to our panel for sharing their tips with us and helping answer questions! The transcript of this chat will always be available at live.fishidy.com if you want to reference it at a future date. FishidyBecome a Fishidy Premium Member to unlock proven fishing hot spots, gain visibility into submerged bottom structure and catch more fish more often - that's Fishidy! Good night everyone, until next time, we'll see you on Fishidy! Thanks for having us! Looking forward to doing it again! Thanks for organizing this, Jon!